The eBook edition of Virtual Danger is available under , especially for those who want to extend the DNGR universe. Or you can listen to the book as an 18-episode audiobook Podcast. In order to implement a radical copyright enforcement scheme, Villain requires one of Robot’s core components, and he’ll stop at nothing to get it; even deactivating Robot and murdering Glitterfairy when she gets in his way. Without affording Death Noodle the opportunity to recover from the loss of his two best friends, Noodle’s UN handlers force him to choose between handing over Robot’s body to be dissected by government scientists or tracking down and defeating Villain all by himself. With a heroic journey that puts Death Noodle through settings, technologies, emotional and philosophical quandaries reminiscent of The Matrix, Johnny Mnemonic, Inception, The Prestige, Total Recall, The 6th Day, and The Second Untrue Trilogy, Virtual Danger delivers all the fast-paced writing and high-stakes action you’ve come to expect from a book in The Death Noodle Glitterfairy Robot Saga. Will Death Noodle be able to save his friends, protect the Internet, and prevent the collapse of civilization, or is he really ‘just a noodle’, incapable of going solo? Teel is happily married to an English teacher and they live together in Phoenix, AZ with a grumpy old cat, a skittish young cat, and thousands of books, both read and to-be-read. Virtual Danger is Teel’s nineteenth book, and there are plenty more trying to work their way into this world through the aperture of Teel’s imagination, hoping to be found and loved by readers like you. Interestingly, none of the others are books in The Death Noodle Glitterfairy Robot Saga—yet. Prologue and Chapter 1: (Prologue) In which Villain interrupts DNGR’s concert to steal a vital component from Robot, killing Glitterfairy and deactivating Robot in the process. (Chapter 1) In which the dust from Villain’s attack settles, Death Noodle begins the grieving process, and Band Manager takes him to Glitterfairy’s funeral. Chapter 2: In which Death Noodle attends Glitterfairy’s funeral, then has to deal with a series of interviews -first with the press and then with a young group of DNGR’s biggest fans- wherein he learns more about Villain and his nefarious plot. Chapter 3: In which Death Noodle meets with his UN contacts and faces a difficult choice. Chapter 4: In which Death Noodle tries to find, on his own, a way to restore Robot to life. Chapter 5: In which Death Noodle takes Robot’s inert body to Tinkerer’s shop in the hope that the old man might know a little more than he about repairing Robot. Chapter 6: In which Tinkerer and Death Noodle examine Robot’s seemingly-inert body and discover the key to unlocking the challenges they face. Chapter 7: In which Tinkerer comes up with a plan for how Death Noodle may be able to restore Robot, which Noodle agrees to despite the considerable risks. Chapter 8: In which Death Noodle finds himself within a virtual environment representing Earth’s Internet, and tries to figure out how to track down Villain, who has Robot’s stolen component. Chapter 9: In which Death Noodle and a virtual Glitterfairy face off against an army of virtual Minions. Chapter 10: In which Death Noodle and the virtual Glitterfairy are saved by a virtual Robot, and Noodle confesses his love for Glitterfairy. Chapter 11: In which the virtual Robot contacts Band Manager, hoping he can lead them to more information about how to locate Villain, but ends up in an argument about Copyright enforcement instead. Chapter 12: In which Band Manager’s disloyalty delivers a captive DNGR directly to the depths of Villain’s virtual lair. 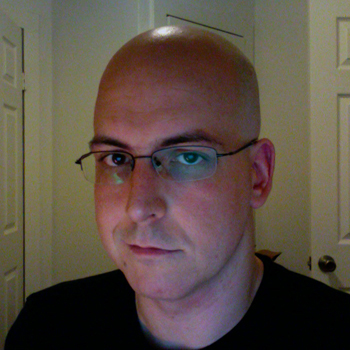 Chapter 13: In which DNGR confronts Villain’s virtual avatar in the heart of his virtual lair. Chapter 14: In which Death Noodle must confront his own inner demons to reach the copy of Robot within his mind, then finds himself face to face with the loss of his friends once more. 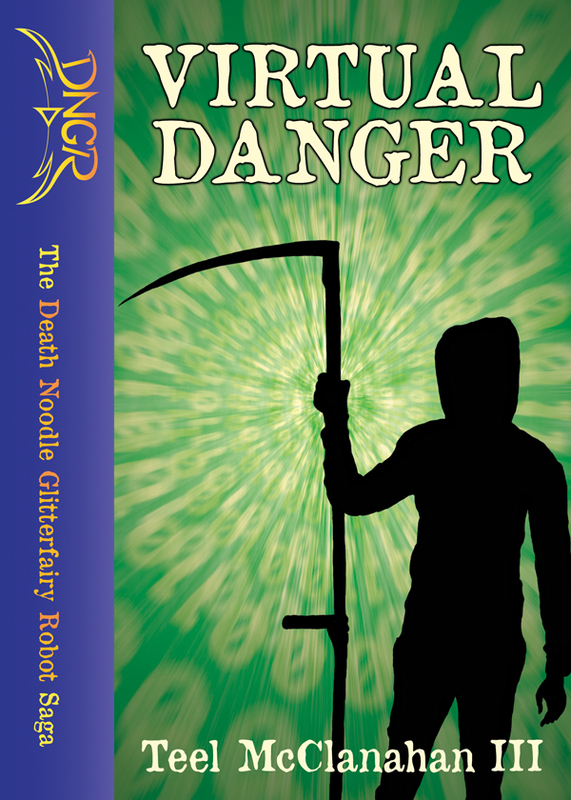 Chapter 15: In which Death Noodle makes a last, desperate attempt to spend time with Glitterfairy before she ceases to exist, only to find DNGR driven rapidly back into action by forces outside his control. Chapter 16: In which Robot struggles with trying to get Death Noodle out of the virtual environment before his own body finishes restoring itself, while Glitterfairy tries to defend Tinkerer’s server from an onslaught of out-of-control virtual Minions threatening them all. Chapter 17: In which Death Noodle and an inert Robot are taken to Villain’s real-world lair, where they face a final confrontation with Villain. Chapter 18 and Epilogue: (Chapter Eighteen) In which DNGR finishes cleaning up after Villain’s defeat, then return almost immediately to their interrupted tour & waiting fans. (Epilogue) In which the modifications Villain made to Robot’s stolen component lead to the unexpected emergence of a brand new threat.